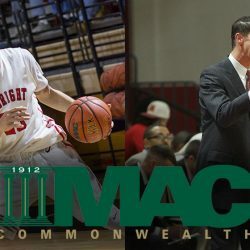 ANNVILLE, Pa. – Senior DeJuan Smith was named MAC Commonwealth Player of the Year and head coach Rick Ferry earned Coach of the Year honors, announced on Feb. 22 by the conference. Sophomore Fred Rowles earned a Second Team selection, and senior Brandon Lindsay is an Honorable Mention. Smith, who also earned a First Team selection, is the first MAC Commonwealth Player of the Year from Albright since Dave Singleton in 2013. Smith has excelled in multiple facets of the game this season, finishing the regular season ranked fifth in the league in points per game with 17.3 and third in rebounding with 7.9. He ranked seconds in the MAC Commonwealth with nine double-doubles, and Smith led the conference with 2.1 steals per game. Smith finished the regular season ranked 15th in school history with 1,454 points. His First Team selection is his first. He earned Second Team honors last year. Ferry earned his third Coach of the Year award and his first since winning back-to-back awards in 2004 and 2005. The Lions defeated two ranked opponents this season, and the Lions got off to their best start since 2012-13 with 11 wins in their first 12 games. Ferry led the Lions to a 12-4 finish in the MAC Commonwealth, earning the top seed in this week’s MAC Commonwealth Championship. Albright’s .792 winning percentage ranked 34th out of 415 NCAA Division III teams. Rowles’ selection to the Second Team is the first all-conference team nod for the sophomore. He finished the season ranked third on the team in scoring, averaging 14.3 points per game. That number was good for 11th best in the MAC Commonwealth. Rowles also ranked fifth in the league in rebounding, pulling down 7.5 boards per contest. Rowles is fourth in the MAC Commonwealth in double-doubles with seven. Lindsay earned selection as an Honorable Mention after averaging 14.8 points per game through the regular season, good for 10th in the conference. He did plenty of damage from three-point range, breaking the school’s single-season three-point record in the team’s final game of the regular season. He ranked 13th nationally in three-point percentage, connecting on 46.1 percent of his shots from downtown.